When no one’s around . . . The “When No One’s Around” series of prints is a whimsical view into the world of snowmen, snowwomen and snowfamilies when no one’s around to see. Each scene portrays those everyday life situations, human emotions, family values and even an occasional political statement presented humorously through snowmen characters. Children relate to the cartoon-like snowmen while adults may see the reflection of their own values, emotions and family members. The original artwork was created with an acrylic underpainting that glows through the overlayed pastel details on the surface. This couple is about to hit the town in their newly gifted ensembles. If you look closely... the signs they're posting read...Stop Global Warming. A family frolics in the first snowfall. I love that the little sledder has guiding hands to greet him. Inflatable toy, goggles and snorkel, is all you need for the perfect winters dip in the pool. Paul actually sat in on a soccer game to capture all the details that occur on the field. Including referees and Dad with camcorder filming his kid in action. Hitting the soft powder to enjoy a ride down the slopes. Something tells me they'll be skipping the hot chocolate in front of the lodge fireplace. Every child has a wish list for Santa. "Tees the Season" for a few rounds of golf. Fly Fishing was a request by a special customer who has a passion for the sport. She has over a dozen of Paul's prints. He wanted to show his appreciation by painting this picture...she was elated! This sweet snow fellow thinks his Christmas will be spent alone...unbeknownst to him his friends are waiting to surprise him. All prints with frames are listed in my boutique Sara's Suprise Sucre Due to the holiday season supplies are limited, so hurry on over to shop. Not pictured, but included is **SNOWMEN PLAYING FOOTBALL** Convo me with any questions. ALL glosses are at blowout prices. The Designer Eco-Tote features collapsible, wipe-able compartments. Giving versatility for grocery's, traveling, craft projects and can be recycled again. I've also marked down the *Girlfriends Stylish Eco Tote* and shipping. Labels: Featured artist and what's in store. Hello Sara, thank you so much for your sweet comment and welcome back note. it's good to be back, I have a lot of catching up to do lol. Your hubby is so talented, I love all the snowpeople, all the details are so cute. I sent you an email. happy holidays, Kathy. Oh I love these adorable prints, Sara!! And the artist is from my neck of the woods! Oh and those lip glosses..ohmigosh, I need to order some! I was going to say for my niece..but I want some for myself too! :) Okay maybe for just me. I get more excited about things like this more than her. LOL! the snowman prints are the sweetest things!!! i wish i had some girly stockings to stuff, you found some really cute things!!! Well sure I want to be included in the tote drawing! I had NO CLUE Paul was an artist! Why haven't you told me that? His paintings are frickin' amazing!!! Those are so cute--the golf one especially. I had no idea you made lip glosses! Those snowman family pictures are really cute, I've never seen those before! Those are just beautiful! Your husband is definitely a family man! Sara, I don't know what is going on with Blogger. Just tried to leave you a message, and it appears it didn't go through. Just wanted to let you know that I love your husband's work. He is SO talented, and these are adorable. He is in some mighty good company because you are a mighty talented person, too! So cute. Happy Blue Monday. What really really neat snowmen pictures your husband (the artist) does!! Thanks so much for dropping by Sara! The snowmen prints are adorable!! I love the cute packaging for the lip glosses! Do you make those yourself? I made some lipgloss last week using my beeswax. It was fun but don't think I used enough essential oil. Sara I hope it is ok with you that I posted your giveaway on my blog- hope alot of friends will come over and visit you! Can say the tote is awesome as i have one i love!!!! !...yes from you! Thank you so much for your kind comments on my Blog and I hope that your husband enjoys that 'Bean Salad'. I love those prints they are so incredible and inviting with a soft touch like feeling. Thanks you for posting those prints. I really love these! They're so pretty! They made my day! Sara, Hi, I'm so glad that you came to visit and left a sweet comment. And I'm excited you joined my followers. I'm having a drawing this Friday with the names of my followers. So now your in it. I visit my followers at lest twice a week, so I'll keep up with what your doing. I absolutely love your husbands paintings. I have a son and daughter-in-law that I don't know what to get them for christmas. I started a snowman tree for them when they got married and it's grown and grown. They both ski and snow mobile all winter. I'm going to check in with your store and see if the snowmen skiers is avalable. Oh my!! Such sweet treats - love 'em all!!! My hubby would love those golfing snowmen. Adorable pictures! I love the tale of your boys getting "snowed on!" Thanks for stopping by our blog last week! I have been out of town on a little mini vacation and have to catch up on my posting! Nola has been knee deep in a work project and has basically had her hair on fire! We need to get back to the posting!! I wanted to let you know that I sent you an e-mail a few weeks ago to find out if you are in the Atlanta area. Did you get it? The snowmen and women art are so sweet! I too love the little snow person in the sled, so cute. And lip gloss, something no woman should ever be without. How do I manage to lose so many when it's such a necessity to moi? I want to thank you for your heartfelt wishes about my step-dad, I carry them with me in my heart. It means much to me, thank you! F A B U L O U S absolutely fabulous. Hi Sara, I just wanted to let you know that I received my paintings and they are beyond gorgeous, my friend is a snowmen nut and she is going to love her xmas gift, thank you so much, they arrived so quickly :-). hugs, Kathy. Thank you so much for visiting our blog and your kind words. These prints are adorable- How lucky to have such a talented artist in the family. I love that black and red tote- have to remember that one. I will happily come back to visit. Ohhh my...I just adore all of your husband's snow people paintings!!! Now aren't you the lucky girl...having this talented honey and his beautiful paintings displayed in your home!!! I just love them all but I think my favorite is the Santa snowman...absolutely adorable!!! Thank you so much for sharing your honey's work with us today...what a sweet treat!!! My friend, I just can't tell you enough...how much I am enjoying my fabulous apothecary beverage jar! A couple of days ago, I filled it up with pretty, sparkly, gold ornaments! Ohhhh...it's gorgeous!!! I'm hoping to get some good photos of it so I can post about it on my blog! Thank you again, Sweetie!!! I am loving my gift!!! Thank you for your lovely visit to our blog. I'm visiting yours for the first time also, and it's a treat for the eyes (and the tummy with those mini pumpkins). So much to enjoy here! I love the Snowmen going out for a night! So cute. 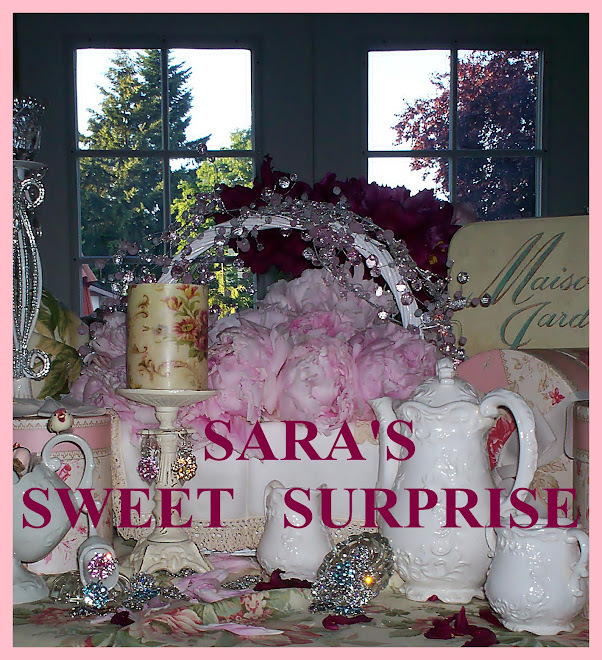 Sara, thank you so much for stopping by my blog and saying hi and leaving such sweet comments. Your blog is wonderful and I really enjoyed the Snowman paintings. Your husband is very talented. Making you a fave on my computer too. Wonderful posts. Hi Sara! Thanks for stopping by and leaving such a sweet note! I just love the sweet snowman paintings! I think my favorite is the Santa Snowman with the snowbabies coming to sit on his lap! Too adorable! I think I will feature it in my post today! Merry Merry Christmas! I just wanted to stop by to let you know that I just posted about my fabulous apothercary beverage jar that you gave me! Thought you might enjoy seeing what I've done with it for Christmas!!! Girl, I am really enjoying this gift...thank you, again!!! Bonjour Sara! Just want to stop by and thank you for following my blog. I loved these snowmen painting, so adorable. The artist is very talented! You have so many lovely things in your boutique, I'll have to check it out. I would like to follow along but cannot seem to find the follow buttin - I'll keep looking! Oh Sara you have me worried about your poor kitty and her limp. I do hope and pray she is okay. Will you let me know how it goes at the vet? I would appreciate it. Chestnut says meow to you and that he is over his photo shoot now. He! Sara - your husband's stuff is fantastic!!!! I love it! You are so sweet! I love you too!